We had decided to come to Phana Monkey Project and volunteer. 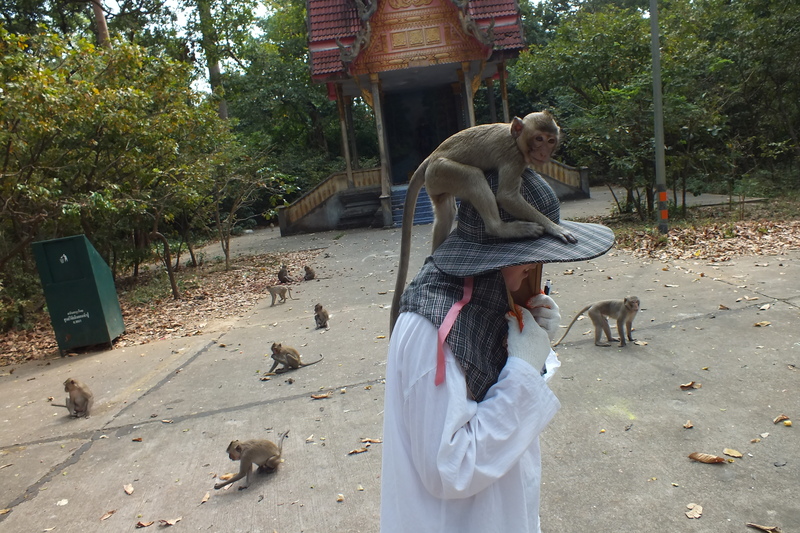 We wanted to be a part of a community, experience some real Thai culture and help with the Monkeys . We were not sure what to expect so we decided to keep an open mind and see this as an adventure . We took the night train from Bangkok and as the sun rose we could see the beautiful countryside and some wild monkeys running in the fields as we passed by. It was a very magical scene. We arrived at Ubon at 8 am and had arranged to meet Lawrence at the station. When we got off the train everyone stood still and the national anthem started to play accompanied by a howling dog. Eventually we arrived in Phana and Lawrence drove us through the forest to meet the monkeys who ran up to the car. It was an amazing sight but nothing compared to what we would be encountering. Later that day we were taken for a walk around the forest to get our bearings and meet the famous monkeys. I felt like an adventurer walking through a sea of monkeys and enjoyed listening to Lawrence’s stories and facts about the forest. We were told not to make direct eye contact with them for too long and to keep some space between us and them and remember they are wild monkeys. Over the next few weeks we began to do visitor surveys. We had to record the numbers and times of visitors and the food types being given. You start to notice different characters and the psychological structure of monkey groups. One day as I was walking through the forest I felt a small hand tugging at my trouser leg and it was an adolescent male monkey wanting my attention. He decided to climb up me and sit on my head! I remembered Lawrence’s words ” just keep walking and they will climb off”. Well this one refused to go. I tried to pass him to Steven and in the end I had to coax him down with a banana. At first it was funny but over the next few days this monkey became more attached to me and I could not enter the forest without him sitting on my head. He started to groom my hair and began to get territorial over me. I have had to try and ignore this little monkey .Whenever he sees me I move away. It makes me laugh to see the similarity between us and the monkeys. They don’t like to get up early, love messing around and some days its just too hot so all they can do is lounge around grooming. We also met the infamous ginger cat! I will leave someone else to write about that. The English lessons at the Study Center are great fun. I enjoyed watching Lawrence’s lesson. The children are so enthusiastic and happy to learn. We volunteer at a primary school in a nearby village on Mondays and Tuesdays. We have a book to follow with their syllabus and the rest is up to us. We found they enjoy singing and games so we do a lot of this, also Bingo is a big hit. Now if I am writing on the board more children sneak in to join the class and I can turn around to find a whole new row has appeared and everyone is giggling. It a lovely feeling when you walk through Phana and children shout your name and English words and sentences at you. A 3-year-old boy from the Kindergarten passed me yesterday and shouted ” Sarah Potatoe” — we had been learning about vegetables. I hear little bits of English all over town now , so many people know who we are and it makes you feel you are doing something very worthwhile. We have even started teaching some teachers at the Study Centre and that was very entertaining. Photos to follow in next blog! Below are 5 little sausages frying in a pan, one went pop and one went bang. I ended up with 17 sausages in the pan, twice! I am writing the words for these songs for future volunteers as it was so popular. So now I am off for a cup of tea and may sneak a bit of Lawrence’s Marmite when he’s not looking. It’s been a busy day and I have to count the Monkeys at 5pm.